So, a little tip for you and possibly the readers! We’ve moved on to the cabinet portion of the kitchen — which is exciting, that’s the bit I’ve been the most thrilled about changing. We’ve been hitting every store in the universe looking for the best possible hardware, from the “big box” stores like Lowes and Home Despot to little family-owned hardware stores. Mostly, the hardware is all “modern” and awful — we were thinking we’d have to shell for expensive stuff from one of the online “retro” places that specializes in period cabinet hardware. The “radar dish” cabinet pulls! I’ve seen ’em online here ‘n’ there for 8 bucks a piece, Ace has them in several sizes and finishes for about 2 bucks each! The “hammered iron” knobs and drawer pulls! This is what was in our house originally, and what my folks had in my house growing up, they’re HIGHLY retro! your house’s original pulls. They’ve got bathroom towel bars and rings and such, too, in nifty retro / chrome styles. Thank you, Jon. When I was in Kentucky recently, I actuallsaw a lot of these pulls — or derivatives of them — at a Home Depot in a suburb of Louisville. The retailer is “Liberty Hardware.” And I bet they are from exactly the same factory in China, because one of my Early American samples — which I have right here on my desk — appears to be IDENTICAL to your black-hammered pull. My other sample, is almost exactly the same as your “burnished gold”, but lacks the burnishing. My recollection was that these were also very inexpensive, around $2 each. 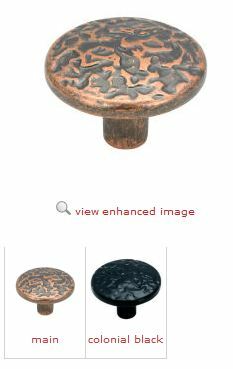 Here is the link to Liberty Hardware’s cabinet knobs and pulls. 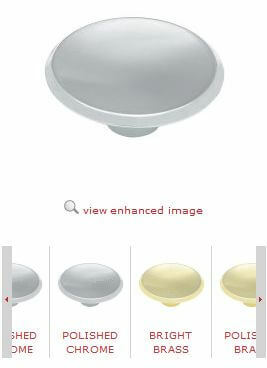 Finally — See my complete category of all researched Kitchen and Bathroom Cabinet Knobs and Pulls here. We were looking for a ‘retro’ cabinet pull for our kitchen too, and I particularly liked the chrome crescent shape one above. We need 38 of the little buggers, so I went looking for them a bit cheaper. I found them (currently on sale) at the website below for about $1.50 ea. They look just like ones I’ve seen in original kitchens from the 1950s and 60s. They are the Amerock brand. Was wondering if anyone has found silver/chrome H-L hinges? I have the hammered iron pulls and H-L hinges but would like to update to chrome/silver. I can find handles but not hinges. Any leads would be appreciated. The link for “these nice little retro items” is not working. Is this cabinet pull not available? Thanks. Stock items like this are always changing… you can look around on Ace Hardware, I guess, to see if this particular item has been listed elsewhere. Otherwise, I’d say that’s a pretty common style — try big name makers like Amerock…. Good luck. Does anyone have any tips on cleaning the copper hammered iron-style pulls? I have the originals in my 1955 kitchen, but they’re blackened with crud from use. Any guidance? **I’m sure though, *new* copper hardware produced today, probably has some sort of clear coat or something to keep oxidation at bay, my old 1962 stuff did not…so be careful when using different polishing products, and YMMV, etc.